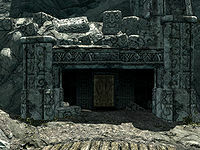 The Warrens is a shelter for the sick and homeless in Markarth. Hidden away a few feet from the Markarth Smelter, The Warrens is where the extreme lower-class citizens of Markarth reside: the miners and smelters, the sick and the lame. It consists of one area, The Warrens. The place is degrading and disgusting, evident by the sick Cairine sitting on the floor all day long, warning you about the place. It contains six rooms for the inhabitants, all with owned hay piles and a sparse amount of belongings. Near the entrance stands Garvey, a trainer in Sneak, 24 hours a day. There is absolutely nothing of value in the main hallway, with the exception of some firewood near the central fire. The first door on the left leads to Omluag's room, with only two owned hay piles. The second door on the left leads to Cosnach's room, again only decorated with two hay piles. The third room on the left leads to Eltrys' room, again with two hay piles, but also a bit of food, a head of cabbage, two slaughterfish eggs, two slaughterfish scales, an eidar cheese wheel, and a harvested imp stool mushroom. On the floor underneath the table sits the key to Eltrys' room. The first door on the right leads to Garvey's private quarters and contains two hay piles and a rock warbler egg. The next room is uninhabited, as falling boulders have covered it entirely. The next room belongs to Degaine who owns absolutely nothing but the two hay piles. The last room on the right belongs to Weylin and is the place you will have to search during the related quest. It contains a hay pile, a table with a pickaxe, a rock warbler egg, and a slice of bread. On a small ledge near the chair sits the key to Weylin's room. Lastly, a chest in the corner contains some gold and random loot and the quest-related note needed to investigate the Forsworn Conspiracy. There is an "Empty" shadowmark to the top left of the entrance door. If you infect Cairine with vampirism during the New AllegiancesDG quest, a coffin will appear in the Warrens[verification needed — location?] and can be used to sleep and get the vampire rested bonus. Cairine does not seem to use it however.